There is a lesser-known, more experimental side of Deco that is not featured in our Deco demos. For this list, we rounded up our favorite Deco secrets to inspire you to push your creative limits. 1. Deco doubles as a DJ-ing tool. I’ve enjoyed plugging the left and right signals from a music player into the Deco for various uses. From fattening up the signal to adding grit and distortion with the Tape Saturation and using the Doubletracker and its knobs to manually dial in smooth modulation and echo to the tracks. Can be a great tool for DJ’s! — Hugo Merida, Customer Support. 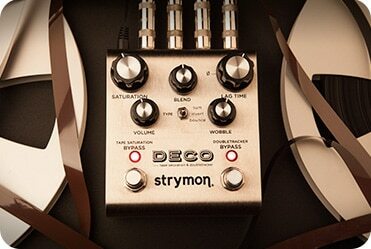 Run a drum track though Deco and check out the auto-flange feature in sum mode. Also try setting Blend to full Lag deck (fully clockwise) in sum mode and play with the Lag knob to create trippy time-warps that sync back to the original beat once Lag is returned to minimum. — Pete Celi, DSP Engineer. 3. Turn ONE Deco into TWO with this setup. For additional saturation/fuzz and repeats, you can run the LEFT channel of the Deco into the RIGHT channel when the pedal is set to stereo input mode. Using a stereo TRS insert cable, connect the LEFT OUTPUT from the Deco into it’s own RIGHT INPUT and use the RIGHT OUTPUT to send your signal to other pedals or your amplifier. This setup is like running 2 Deco pedals in a row! (This will only work with MONO signal chains with the WIDE STEREO feature turned off.) Turning up the SATURATION knob will provide more drive than you would get with a standard connection setup (keep in mind that this also raises the noise floor of your audio signal). When using the Doubletracker with this setup you will get an additional repeat in SUM and INVERT modes, and, if you have the SATURATION on and turned up high enough, you’ll get infinite repeats in BOUNCE mode. – Gregg Stock, Analog Engineer. 4. Deco also loves bass. I use a custom signal splitter to route my bass to two channels. One signal path runs through OB.1 and Flint to boost the hot signal and add some tremolo. This hot signal is then run through Deco and out to my amp. This hot signal drives Deco’s Tape Saturation, providing a heavy growl. The other signal path runs straight to Deco and out to my Mark Bass Combo. This clean, round tone is warmed up by Deco’s Tape Saturation, but does not produce the heavy growl. This marriage between an aggressive, somewhat distorted tone and a warm, clean tone carrying the low frequencies produces my favorite bass tone ever. In this setup, Deco’s volume control works as a master volume for both channels. I can also engage Deco’s Doubletracker to manipulate both sides of my signal. — John Brinkman, Code Communicator. 5. You can use Deco to master a recording. Here’s a side by side comparison of two recordings taken from my last gig with my band The Alpine Camp. The first recording is clean; the second is run through Deco with some Tape Saturation applied. Deco’s Tape Saturation adds light tape compression, provides a nice grittiness to the piano parts, and really rounds out the low frequencies. These are just some of Deco’s lesser-known features and capabilities. We encourage you to try these out yourselves and hope that they will inspire you to push your own creative boundaries! Michael Callas spent some time writing for Strymon in 2014, and is now off making a name for himself in the film industry. Wow your ears must be better than mine, because I actually do not hear any difference between the two sound bites. It must be VERY subtle. Not meant to sound negative; I simply don’t hear the effect. if anything, the top end of your hearing must be gone. Perhaps it’s not his hearing… maybe Steve just needs better monitors?, i.e. : the difference is profound on my KRK V8’s. the harsh edginess and smoothing out the highs. @rck – Yes, that will work! another question, which side is first in the signal chain of the Deco? The Saturation or Doubletracker? @rck – On the Deco, the input(s) feed the Tape Saturation, then, it goes into the Doubletracker. I can hear the difference even on my pair of partially broken iPod headphones. A-B those drums at around 8-10 seconds – there’s a world of difference; it’s not simply clean gain. Not sure if I’m just being stupid, but I can’t find the mastering demo. Where is it? So late joining the party…what confuses me ongoing is that if you are recording back to digital, aren’t you back to the same limitiations in missing the analog overload I used to record past into the VU red zone? Seems then that any processor that puts some warmth back into the signal such as a mild overdrive, perhaps with extra compression would be the same idea, if not the same exact tone. Can I get you opinion before buying yet another device cluttering my space. Thanks in advance. 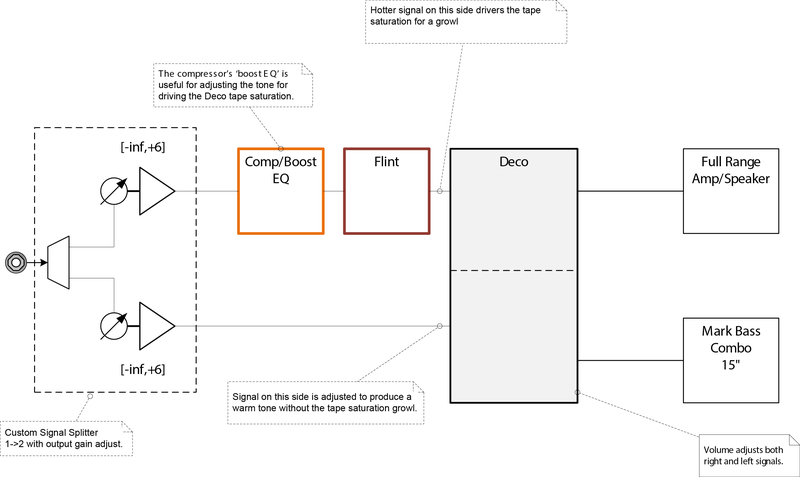 @Howard – Deco’s Tape Saturation allows you to work within the digital domain’s signal level threshold and achieve a simulated analog overload of a reel-to-reel studio tape machine. I’m sure experimenting with different drives and compressors in series can net interesting results in trying to achieve a similar effect. I’m wanting to use my Deco in conjunction with my audio interface (Roland Octacapture) to add tape saturation when tracking vocals. As I understand the Octacapture has external outputs but no return. How should I set up the signal path to be able to use the Deco in this situation? I’ve tried running from the Octacapture’s external out > input of the Deco and the output of the Deco > input 3 of the Octacapture. This created feedback issues. Do I need to assign input 3 as a return? If so, is this done using the Octacapture or in Logic? Apologies for the noob question, I’m new to the recording game! @Chris – There are many different ways to do this. You can try recording your vocals dry, then, afterwards, assign that vocal track to output from output 3 => Deco INPUT; Deco LEFT OUT => Input 1 of the Octatrack to record on a different ‘wet’ audio track.